When my youngest was a baby, I cherished that last feeding of the night. I’d settle into the rocker in his room and, while he nursed, I’d sit in the dark hush of his room. As he fell asleep, I’d let the rhythmic rocking and gentle sound of his breathing calm my soul. I’d clear my head of thoughts and just listen, opening myself to God’s presence. Maybe it was easier then because I was so sleep-deprived and my inner monologue was exhausted too, but I could sit for 15-20 minutes of total silence and just be. Some nights, I didn’t feel God’s presence. Other nights I knew He was there, comforting this weary momma’s soul. On a few special nights, I heard Him speak to my heart. The thing is, we usually can’t hear His still small voice unless we’re quiet. So, in the dark quiet of a baby’s room, rocking a sleeping little one, I was able to take that time to get quiet enough and truly just listen. I had no where else to be in that moment, no other task more important than getting the baby to sleep, so I could focus on listening for God. As my son grew too big to rock to sleep, I worried that I’d lost my special time with God. How would I get that time and place to just be with Him in the silence? I found that our prayer methods and forms of quiet time change with our life’s seasons. In this season of life, I’ve found my best time with God is taking a long bath at night, after the kids are put to bed. I can sit in the candlelight, usually with soft music and allow the gentle hum of the jetted tub clear my mind of the day’s thoughts. I can sit with God and listen and pray. Or, I’ll get up very early in the morning, before the rest of the family wakes and sit with God in the hush of a still-sleeping house. So, how do you find that quiet time with God? What is your special place? What is your technique to clear your mind and listen for His still small voice? Sometimes we need to spend our prayer time just listening, allowing God the space to speak to our hearts. We used this listening prayer at a conference recently and it was one of the most moving parts of the day. We spent 3 minutes in silence with God, yet even in that short time I could see people visibly moved by how God was speaking to their hearts. Set aside some quiet time when you can focus. Take some deep breaths to clear your thoughts or use a breathing exercise. Close your eyes and clear your thoughts. Ask God to be with you in the silence and to speak to your heart. Sit in the silence and listen for God. Start with 3 minutes and work up to 15 minutes or more. After your time of silence, reflect on the experience and how you felt God speaking to you. Take notes of what God places on your heart. Maybe use one color for God’s words and another color for your thoughts and responses. Subscribe below and I’ll send you a free printable set of Pray Deep prayer cards, including ones on listening prayer. 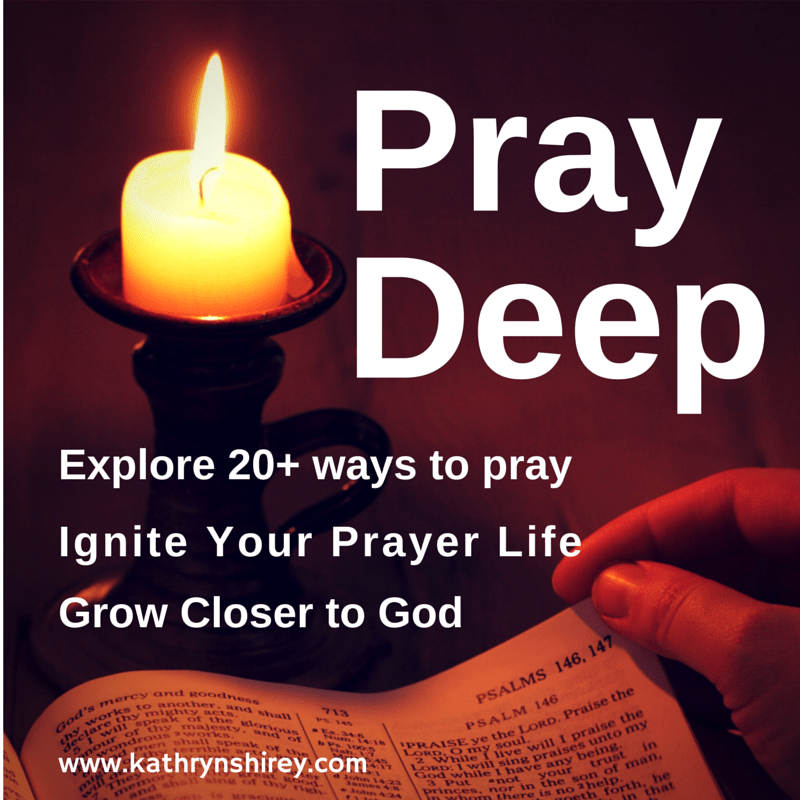 PRAY DEEP CHALLENGE: Try 3 minutes of silent, listening prayer today. See how it feels to settle into silence with God and just listen for His still small voice. Journal about your experience. « Is Your Prayer More Than An 11th Hour Desperation? Thanks for this post, Kathryn, it goes right along with the thoughts I’ve had that were sparked by your taize post! I’ve been thinking about “listening” to God more lately. What a great idea to take a bath!!! That’s an original way to spend time focusing on God. I think I’m going to take your suggestion and try to set aside some 3 minute time increments during my day. I can stop and take a break for 3 minutes! I can do this! 🙂 Actually, GOD can do it in me. Thanks. Thanks for the reminder about Taize – used that for my prayer time this morning and it was just the spark I needed today. Try the 3 minutes of silence with God – it feels like forever the first time, but is such a good way to just be still and listen. Love the idea of taking these increments throughout the day – if only I could find a quiet place at my office! It’s hard to slow down and listen sometimes. I love these reminders and suggestions for finding a listening time. When we slow down and listen, His still voice is bigger than all of life’s noises!!! Thanks for sharing! Stopping and just listening can be so hard – and the minutes so long – but I’ve found it’s one of the best ways to connect with God’s voice. I can relate to certain seasons of my life where it seems I can hear or feel God closer than at other times, even though that’s not true since he’s always listening, always caring. I like the idea of sitting in silence for a few minutes, although it can be hard to do! I’m challenged to find new ways of listening for his whispers instead of ways that I might expect — love this! I sometimes think of hearing God’s voice as tuning in to a distant AM radio station. We have to learn His voice so we can hear it over all the static to know we’ve found the right station. Spending time listening trains our ears to hear Him, even when we’re not quiet. What a wonderful insightful post. I love the idea, if we get still enough and listen carefully, that the almighty God can talk to us. I always envied Adam and Eve their evening talk with God but if I can quiet the sounds of the world and all that is pulling at me, I can have the same thing. Thanks so much for sharing !!!! How awesome must have that have been, to spend the evenings hanging out with God. yet, we can do the same if we’ll just give Him the time.